This is a video of the Dwr-y-Felin pupils performing their researched piece, 'A near enough history of Neath Abbey' as a final product of their participation in the project. 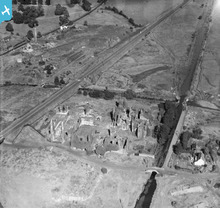 [WPW043064] Neath Abbey (ruins), oblique aerial view. This was Neath Abbey as it was in 1933 during the excavations carried out by the Neath Antiquarian Society.